North Mymms Park is situated in Hertfordshire, four miles from Hatfield, just North of the M25. From the South leave the A1 (M) at junction 2, then at the roundabout take the 2nd exit onto the A1001 (signposted Welham Green). At the next roundabout continue on the A1001 (3rd exit) and after 1 mile take the 2nd roundabout exit onto Dixons Hill Road. Continue on Dixons Hill Road for 0.7 miles, passing back over the A1(M). For St Mary’s entrance, take the first left after the motorway bridge and pass to the left of the red brick lodge house up the avenue of lime trees. St Mary’s entrance is on the right before the church. 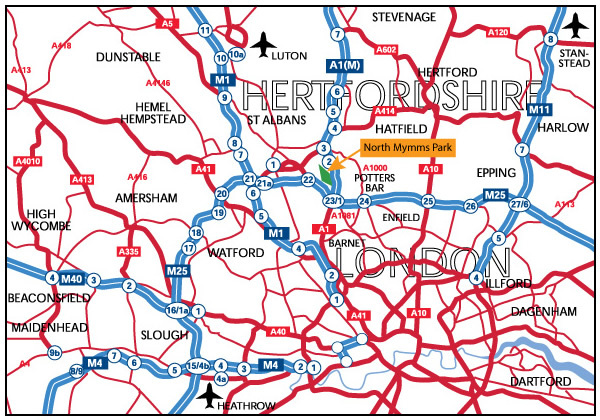 From the North leave the A1 (M) at junction 3, then at roundabout take the 2nd exit onto the A414 (signposted St Albans). After 1.4 miles turn left (signposted Colney Heath). Go straight over the next roundabout after 0.7miles, (2nd exit) onto Tollgate Road. Red Lodge Entrance is after 1 mile on your right. For St Mary’s Entrance continue a further 300 metres and take the last road on the right before the bridge over the motorway. Pass to the left of the red brick lodge houses and up the avenue of lime trees. Alternatively at junction 3 it is possible to take the first exit onto the A1001 (signed Welham Green) and then follow the directions above as if coming from the South from junction 2.